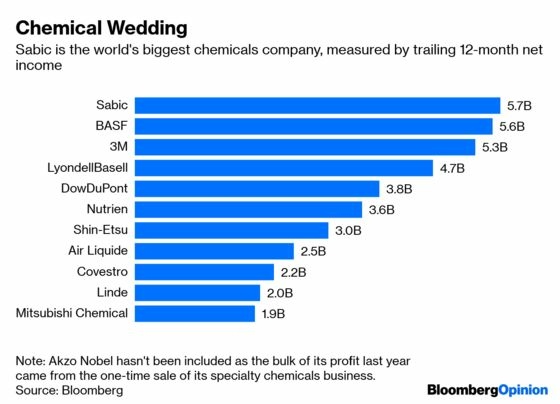 (Bloomberg Opinion) -- It’s not every day that the world’s biggest oil company buys the most profitable chemicals business. Saudi Arabian Oil Co., better known as Saudi Aramco, will pay 123.4 riyals a share for the 70 percent stake of Saudi Basic Industries Corp. held by the Public Investment Fund, the country’s sovereign wealth fund, the suitor said in a statement Wednesday. On the face of it, that looks about as run-of-the-mill as 259 billion riyal ($69.1 billion) transactions can possibly get. The price is pretty much in line with the level at which Sabic stock has been trading over the past year. All three main players are essentially arms of the Saudi state, so in a sense the takeover is no more than a reshuffling of assets in the government treasury. At the same time, it gives a clue to where Riyadh sees the oil market going — and the answer isn’t especially appealing either to Aramco or Sabic. One leg of the transaction is that Saudi Inc. is going short oil and long private equity. It’s not clear yet how the transaction will be financed, but any deal will involve using Aramco’s income and balance sheet to fund a gigantic cash payment to the PIF, which can in turn be spent on whatever projects Masayoshi Son and Stephen Schwarzman feel are crying out for capital. As my colleague Liam Denning has written, that as much as anything should make you worried about the future of oil. 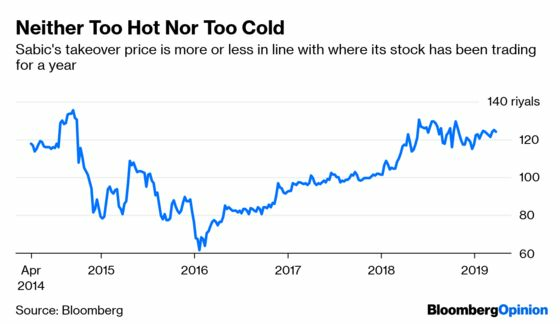 If the best use of Aramco’s capital is to invest in WeWork Cos. rather than, say, producing more crude, which currently earns margins north of 80 percent, the future for oil demand looks very dark indeed. The reason for optimism on that front is embodied in Sabic itself. Many of oil’s traditional uses are already in decline: Consumption of fuel oil for heating and energy output peaked a generation ago. Even under current policies the world will use less gasoline in 2040 than in 2017, according to the International Energy Agency. (Something closer to complying with the Paris Agreement on climate change would cut gasoline consumption in half and reduce diesel demand by a third). Chemicals, though, are a bright spot. 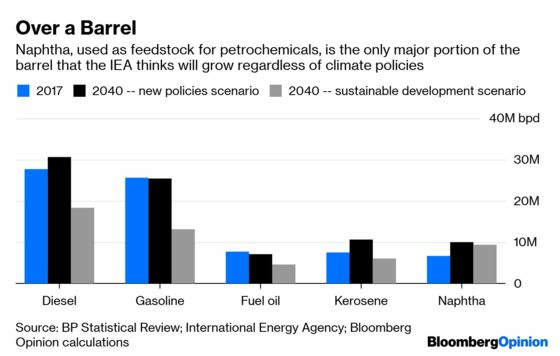 Naphtha — the volatile mix of short hydrocarbons used as feedstock for plastics manufacturing and other petrochemicals — is the only major component of the crude barrel where the IEA expects to see consumption increase, regardless of action on climate change. Other companies, such as the world’s biggest packaging business, Amcor Ltd., have been betting that consumer demand for plastics will prove resilient, despite concerns over climate costs. That may well prove correct. Still, analysts of late have started to question whether the forecasts of demand growth for plastics are overblown. More parsimonious usage, reduced use of disposable bags and increased recycling could cut oil demand from petrochemicals by 20 percent, according to Christof Ruhl, the former head of research for the Abu Dhabi Investment Authority. 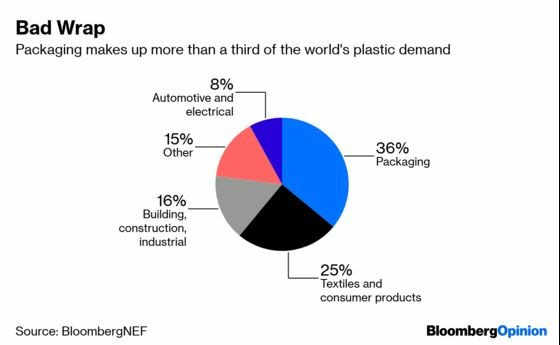 About 400 million metric tons of new plastic are produced every year and 300 million tons of waste generated, with only 55 million tons of that total being recycled, according to a BloombergNEF report in January. Lifting the recycling rate for polymers to 60 percent from its current 18 percent would reduce oil demand by about 1.5 million barrels a day, based on the report’s numbers — enough to take a substantial bite out of that projected demand growth. Worries about the sheer volume of single-use plastic waste help explain why the buzzword in the industry these days is the “circular economy” — the idea that polymers should be re-used and recycled rather than landfilled and incinerated. As an independent company, Sabic has been committed to the same recycling agenda as rivals such as BASF SE, LyondellBasel Industries NV, and DowDuPont Inc. That made a lot of sense on purely commercial terms: Getting more of your feedstock from waste dumps rather than oil wells can look like a common-sense way of tapping alternative sources of cheap raw materials. The argument doesn’t hold up quite as well now. Making more use of recycled plastics risks antagonizing Sabic’s controlling shareholder, which hopes to sell it as many as 3 million barrels a day for turning into petrochemicals. Sabic looked like a smart way for Saudi Arabia to offset the risk of a future that’s less dependent on crude demand. In hitching the business to Aramco, the government has weakened that hedge.